Any quantity only $0.00 per coin over spot! For those looking to buy silver from the South African Mint, the Krugerrand coin design was long left out of this program. From the 1967 introduction of the gold version of the coin until 2017, silver buyers had no option to buy. With the 50th anniversary of the program in 2017, that all changed as the South African Mint issued its first-ever Silver Krugerrands. 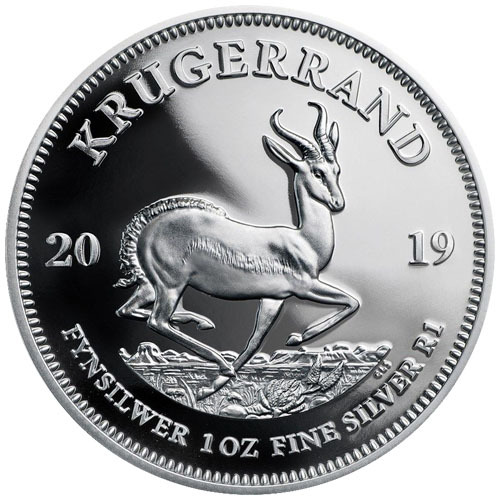 The 2019 1 oz Proof Silver South African Krugerrand Coin continues the brief legacy of this silver coin and is available to you today at Silver.com. 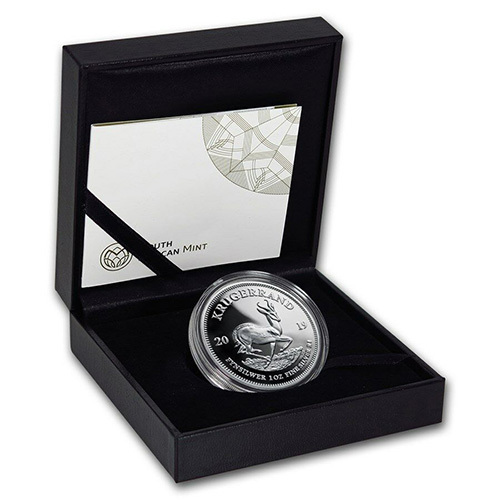 Coins ship to you inside of South African Mint boxes with a Certificate of Authenticity! Third release of a Proof Silver South African Krugerrand! Paul Kruger’s effigy is featured on the obverse. The Springbok antelope is found on the reverse. Silver South African Krugerrand coins made their debut in 2017. In this release year, the first-ever issues in the collection included a Premium Uncirculated coin designed specifically for the 50th-anniversary celebration of the Gold Krugerrand coin. There was also a Proof Silver South African Krugerrand Coin issued in that year. The designs of the Proof Silver Krugerrand Coins are the same as those from the Gold Krugerrand. The modern designs on the Krugerrand coinage were last updated in 1984. Coert Steynberg created the image of the Springbok antelope on the reverse face, while Otto Schultz was responsible for the updated effigy of Paul Kruger. The first democratically elected president of a new South African Republic, Kruger’s face appears on the coin and his last name was combined with the national unit of currency (Rand) to form the name of these coins: Krugerrand. On the reverse of 2019 1 oz Proof Silver South African Krugerrand Coins is the image of a Springbok antelope. Found exclusively on the African continent, the Springbok’s natural range consists largely of South Africa and other nations within the southern reaches of the African continent. 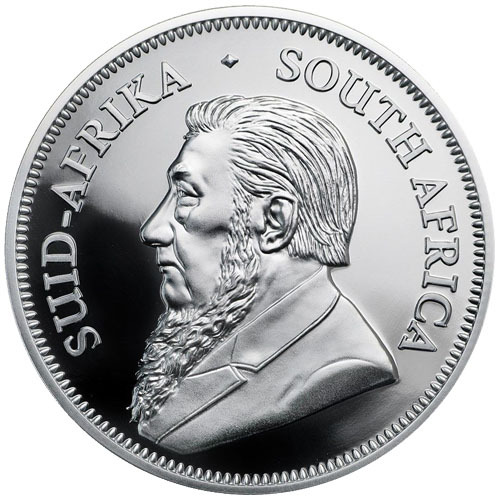 The obverse of 2019 Proof Silver South African Krugerrand Coins includes the left-profile portrait of Paul Kruger. A Boer military and political figure, Kruger fought for independence from British rule in South Africa and served both as a member of the triumvirate ruling South African before independence and later as its first president from 1883 until he was forced into exile by the British. The 2019 1 oz Proof Silver South African Krugerrand coins in this listing ship inside of South African Mint black commemorative boxes and come with a Certificate of Authenticity included. We encourage Silver.com customers to contact us with questions on the phone at 888-989-7223. You can also connect with us online through our live chat and email address features.